Something has been happening lately with Hugo. He's been coming out of his self-imposed kitty exile. I'm not saying that he is unafraid of Ray, but Hugo is certainly less afraid than he was previously. This morning when I settled in on the couch for breakfast, Hugo came downstairs with me as he used to do in the days Before Ray (BR). Ray was having a quiet morning. He was curled up on one of the chairs taking an early morning nap (having been awake just long enough to eat breakfast). Hugo jumped up on the couch and came over for a brief belly rub. He wasn't able to completely relax with the dog in the room so he went to the other end of the couch and settled down there. Ray noticed that Gregg had vacated the other chair in the room so he stretched off of his chair and started to walk around the coffee table to go sit there (Gregg's chair is obviously better even though they are exactly the same). Hugo hissed at Ray as he approached but held his ground and did not dash for the stairs. Ray slowly backed away and went to sulk in the hallway. For about a minute. Then he got up and took a different route to get to Gregg's chair where he curled up and fell asleep. Hugo remained on the end of the couch, feigning relaxation. I went upstairs to get dressed so that I could take Ray for a walk. Usually Hugo would never be alone with the dog in the same room but he didn't budge when I got up from the couch and remained in place until Ray decided that he needed to come upstairs to see where I had gone. At this point Hugo thought maybe it was a good idea to take a hike. I decided to take Ray on a different route than usual. (I'm learning a lot about my neighborhood now that I'm on foot). We hadn't gone too far before I realized I'd forgotten the spritzer. I didn't want to turn around, mainly because it's too hard to get Ray to turn and go back home before he's good and ready, so I just hoped for the best and kept on going. We met Halle and Deborah (Halle's Grandma) about 2 blocks out, but Ray behaved himself beautifully. He's always on his best behavior around Halle because he's still trying to impress her. Deborah and I chatted briefly while Ray licked Halle's face, then continued on our ramble. We were on a street that parallels the one that goes to the lake and had just turned onto a road that would take us there, when a little, black, terrier-type dog came running out of the backyard of a house next to us. He started to follow us and it was clear that the dog didn't live in that house, he was on walkabout. Ray was sooo happy to have his long-lost-friend-that-he'd-never-met-before join us. He was lunging and plunging and wagging his tail (I shoulda gone back for the spritzer). The little dog zipped in and out under Ray's tap-tap-tapping, now-where-did-he-go paw. A trash truck came zooming down the street and all I could see, in my mind's eye, was a little, squished black dog on the road. He had a tag on his collar so I stooped to try to read what it said. Between the walk, the heat, and trying to control Ray and keep him from stepping on the dog, I was sweating like a stevedore (or is that supposed to be swearing like a stevedore....? In any case I was REALLY sweating). The print on the dogs collar was tiny. I had trouble reading the address because of the sweat rolling down my forehead and into my eyes. I didn't recognize it. I heard a voice coming from across the street so I scooped up the little dog and headed across the road. It was at this point that I realized the dog reeked. No wonder Ray liked him so much. The dog must smell like roses to a blind hound like Ray. A woman was working on her screened-in porch. "Hey," I called to her, "There's a little stray dog out here, do you know where Strene Ct. is?" "No, I've never heard of Strene," she replied. That's because I had read the name totally wrong. "Do you have a phone?" I asked. Ray was still plunging and lunging and trying to play with his favorite new friend. By this time, he was doing his Ray thing and yelling in the dogs face. I was dripping sweat, trying to keep the inexplicably-named Maximus close by, keep ahold of Ray, and stop him from yelling to wake the dead. The woman, my new friend Analisa, came out with a cell phone. On Maximus' collar, in print microscopically small, there were three phone numbers, his name, and his address. I read the first number to Analisa. No answer. I read off the second number although I couldn't really decipher the second numeral (3? 5? ), wrong number. I read off the third number. Answering machine. I looked at the name of the street again. It wasn't Strene but Sterne. "Hey," I said, "It's not Strene, it's Sterne! Do you know where Sterne is?" "Oh!" she exclaimed, "Sterne is back that way and up. On the left." Analisa mentioned that she had a dog. "Can I borrow a leash?" I asked. "I'll just walk him home and then bring you the leash back." Analisa agreed and went to get a leash. I clipped it onto stinky Max's collar and headed up the street. Ray was thrilled to be walking with Max. I think he believed he was getting a brother. Just what he wanted! One that smelled like roses too! It just couldn't be better! No one was home when we arrived at Max's house. I checked the gates on both sides and they were closed. I put him in the back yard then looked for holes under the fence. It looked like maybe he could have squeezed through where the mulch was dug out a bit, (he was a little dog) so I took a bag of soil that was conveniently nearby and put it over the hole. That should keep him for 15 minutes, I thought to myself. I dragged a forlorn Ray away from his best buddy and back to Analisa's. By this time sweat was rolling off of me in buckets. Analisa and Angel, her immense German Shepherd, met us at the door. Angel was acting like she'd like to tear Ray limb from limb. Ray wagged his tail. He's never met a dog he didn't want to befriend. I thanked Analisa for the leash and we talked about dogs for half an hour or more. I was trying to will myself to stop sweating but it wasn't working. Ray licked Analisa's toes and flopped over for a rest. Angel calmed down and looked like maybe she was coming 'round. Ray can really charm the women. He uses a different technique for each one, but in the end, he gets them all (except the Chihuahua Mitzi). The air conditioner of home was a welcome relief. I headed for the shower. 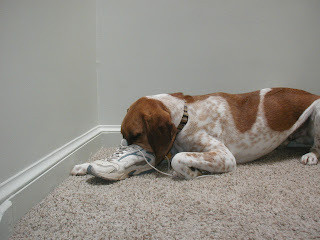 When I got out, Ray was on the stair landing huffing my shoe and playing with a cat toy. Serendipitously, I found this poem on the page-a-day cat calendar and thought "Huh, guess it's not just dogs." Glad to see Hugo and Moonie are gradually getting back into their routine with Ray now in the house. It does take time -- your days are certainly filled with adventures with Ray. I'm happy to see that you're still following Ray the Blind Dog! Moonie and Hugo were both downstairs this morning while Ray was passed out in the kitchen after our walk. When he finally moved, the cats moved upstairs but they aren't as frantic to get away as they were before. Progress!